Nokia announce the Lumia 925! Nokia's new flagship is ranked just above the Lumia 920 in the naming convention and essentially this is the Lumia 920 in another disguise. There's a new AMOLED screen with the same 1280 x 768p resolution, which is coated with Gorilla Glass 2. Otherwise there's 1GB of RAM, a dual-core Qualcomm Snapdragon processor clocked at 1.5GHz will be powering Windows Phone 8 and the rear camera is again an 8.7MP sensor from Carl Zeiss. This time though Nokia are adamant that there's some hardware and software improvements which make everything that little bit sharper and a little bit better. lighter, coming in at 135g, which is more what you expect in high-end smartphones! The device has also ditched polycarbonate, or as we like to call it plastic, in its place there's now a nice aluminium body, but strangely that means you have to put a plastic case on the back of the phone to enable wireless charging, which seems a little silly to us! But, the addition of global 4G LTE connectivity, GPS, Bluetooth, NFC and Wi-Fi makes up for looking silly while it's charging. 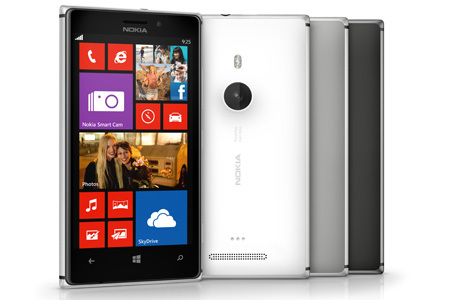 There's a few software improvements here too with the addition of a new camera mode called Nokia Smart Camera. Essentially it captures 10 photos in quick succession before allowing you to edit the photos with a bunch of cool effects such as Best Shot, Action Shot, Change Faces and Remove Moving Objects. 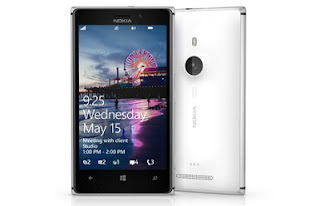 The Nokia Lumia 925 will set you back about 469 euros and Vodafone will be carrying the device in Europe, T-Mobile will have it in the USA and we expect to hear more announced soon, but O2 have confirmed they'll have the white one in the UK! There's a little video showing off the internals of the device below, which also has a really catchy soundtrack to go along with it, which gives you a better idea of what the phone looks like too! For full details check out Nokia Conversations here and for a full run down of the specs check out the Nokia product page here!